High index eyeglasses have been rising in popularity in recent years, and there are many good reasons why. If you have a high prescription of vision correction, you’re already familiar with the problems you face with traditional glasses. Generally, the higher your prescription is, the thicker your eyeglass lenses will be. For those in need of serious vision correction, that means thick, bulky, and obstructive glasses. At least, that’s the way that it used to be. The modern alternative to cumbersome ‘coke-bottle’ glasses is high index lenses. High index lenses are a fairly recent development in the field of optometry, but they have been readily accepted as a substitute for the older style of strong-prescription lenses. High index lenses are not only lighter, thinner, and more comfortable to wear, but they are also more attractive because they won’t cause the distortion of traditional lenses. Like regular glasses, high index eyeglasses come in a wide variety of styles and frame options. But another option that you may not have considered is the material of the lenses themselves. In the early days of eyewear, glass was the only material from which glasses were crafted; in modern days however, glass has been replaced by safer, more sturdy materials. In 1947, the first plastic eyeglasses were invented in California by the Armorlite Lens Company. Plastic lenses were superior to glass in many ways, as they were lighter and much safer to wear – plastic didn’t pose the risk of shattering that glass did. Plastic and polycarbonate lenses soon became the norm for eyewear, but glass still had its place. Glass lenses were scratch-resistance, and glass performed extremely well for vision correction - especially when it came to high-prescription lenses. Though it was twice the weight of its competitor, glass could provide better vision correction with a thinner lens compared to plastic. Plastic high index lenses are extremely lightweight. Plastic lenses are nearly 60% lighter than glass, and with the thin design of high index lenses, the difference in weight will make a big difference in the comfort of your glasses. Plastic high index lenses are resistant to shattering and cannot splinter. They are much safer for use in activities where your ordinary glasses may be damaged, as plastic is a more sturdy substance than glass. Plastic lenses may be used for all frame types, including half-rimmed and rimless frames, which are a popular fashion. With the use of plastic lenses, individuals in need of strong vision correction have the freedom to choose from all the same styles as those with lesser corrective needs. High index lenses often cause some kind of aberration (blurring of forms and colors) in your peripheral vision. With plastic lenses, this aberration is much lower than it is with glass lenses. 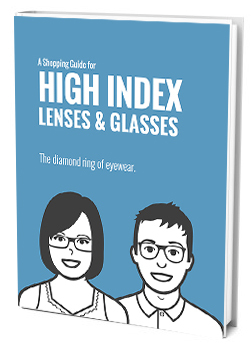 With high index eyeglasses, you have more options today than ever before. To be certain that you’re choosing the right type of eyewear for your vision and lifestyle, make sure to discuss all of your options with your eye doctor. For more information on styles, options, and quality high index lenses, Please visit our website.